I know that the specs listed about trucks are just long columns of boring numbers, but those numbers actually do have some meaning in the messy real world. 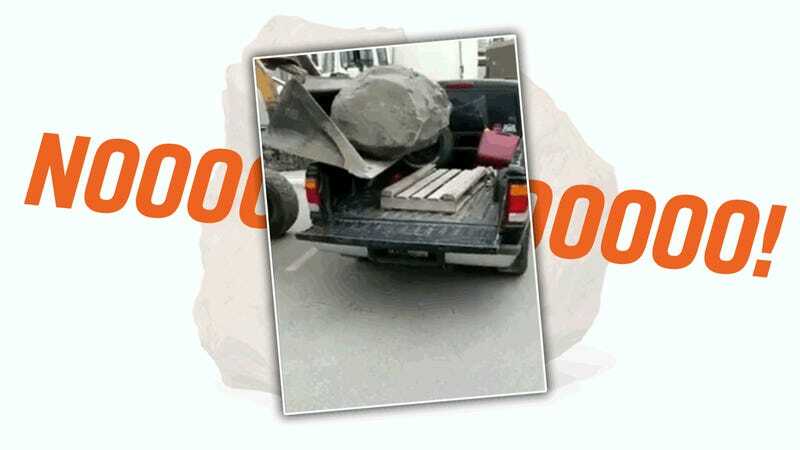 The amount of weight you can comfortably place in the bed of the truck, the payload, that’s one of those numbers. Even though neither that boulder or that Ranger can read or understand numbers, together they do a remarkably good job of demonstrating why they’re important. I’d also like to point out that the voices off camera—the truck’s owner and his friend—are kind of jackasses. They berate and pester the front-loader operator enough that when that boulder and all its mass smush that Ranger down so low it’s resting on its bump stops, you can’t help but feel a little jolt of schadenfreude-flavored thrill. Also, I like how the friend all of a sudden becomes an expert on payload capacity once everything’s well and truly fucked. Thanks for that, dummy. A Ranger of that era had a payload capacity of around 1,250 lbs or so. I’m told a boulder weighs about 150 pounds per cubic foot for a sandstone boulder—other mineral types may weigh more. Let’s assume that one is sandstone for the hell of it, and do some guesswork. It looks like the dimensions are about three feet by five feet by two feet or so, for a total of 30 cubic feet, which at 150 pounds per cubic foot comes to 4,500 pounds. Is that right? I bet it’s somewhere around there, based on the ease by which it flattened out that truck. Who knows. All I know is that if you treat the front-loader guy like a jerk, this is what you get. Also, how was he planning to get that out of the bed? Hand truck?